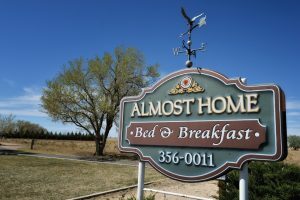 When you’re “almost home” but with still too many miles to go today, Almost Home B and B is just the place – for its comfort and warmth, along with magnificent sunsets, will make it seem as though you’re almost home! Almost Home is only one half mile south of the city limits of Portales. Portales is the home of an excellent and burgeoning dairy industry, some of the finest peanuts grown anywhere in the world, and in the middle of ranch country. In addition, Portales and Roosevelt County is a thriving and growing community with both new businesses coming in and a resurgence of the downtown area. And to top it off, Portales is the home of one of finest small universities in the nation, Eastern New Mexico University. With ENMU comes collegiate music, theater, and sports to thrill you. There are three museums on campus — Natural History, Blackwater Draw, and Roosevelt County. With all of this, there are several things to easily fill up a couple days of sight-seeing to say nothing of the true refreshment that comes with a night or two stay over in Almost Home. 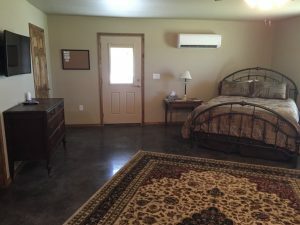 All three suites have fully functioning kitchens with dishes, silverware, stove, refrigerator, and microwave. All three suites have a queen bed and a sofa bed. The Southwest unit is also ADA fitted, should that be needed. All Three suites have flat-screen TVs and are connected to HD satellite. The SW and EC suites have surround sound installed. 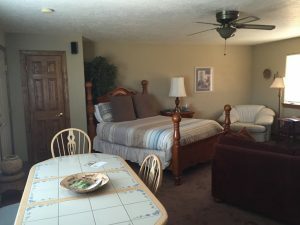 Southwest Suite – a warm large room fully furnished in southwest America décor. 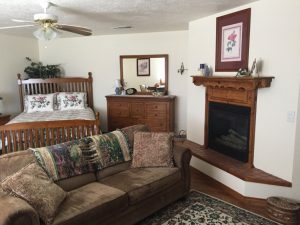 English Cottage Suite – a large inviting room fully furnished in an English country cottage style. Roadrunner – a very comfortable room making for a very restful night — appointed in travel memorabelia.